The Lambert Centre monument is a flagpole. It is modelled on the flagpole on Parliament House Canberra. 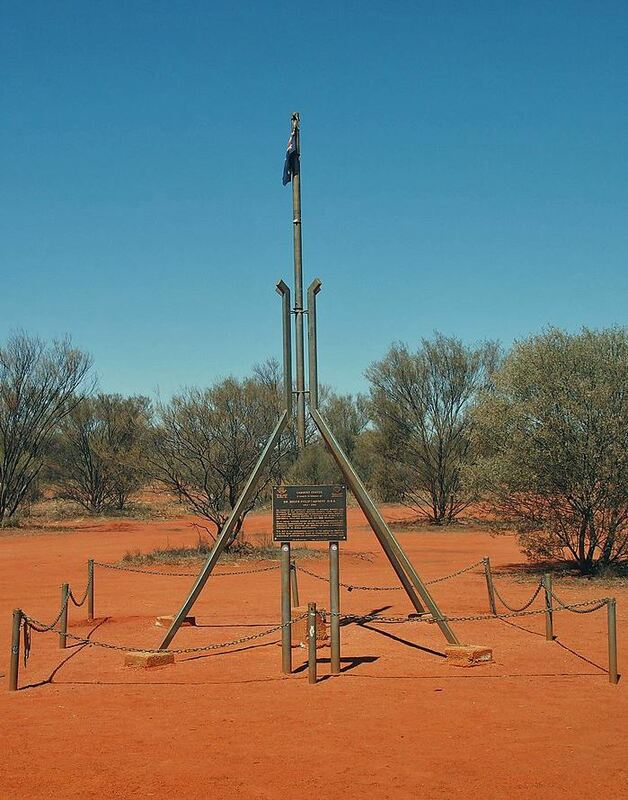 The flagpole was erected by Members of the (now) Royal Geographical Society of Queensland (RGSQ) on 15 September 1988 on Lilla Creek Station, Northern Territory. It was erected in association with a Permanent Survey Mark (PSM) which was placed at the nominated geographical coordinates of the “Centre”. The flagpole represents the Geographic Centre of mainland Australia. “Lambert Centre” is a Place Name formally gazetted by the Northern Territory Lands Department. The location of Lambert Centre was computed using mathematical modelling. The most accurate mapping data available was used in the complex calculations. The modelling provided a Latitude and Longitude with a probability that the Geographic Centre of Australia lies within 2.5 kilometres of the calculated value. This accuracy is a high-level achievement given the mapping and computer power available in 1988.